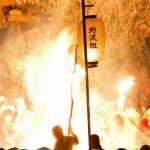 The next Nozawa Onsen Fire Festival will be held on January 15th, 2020. It is held on the same date every year. 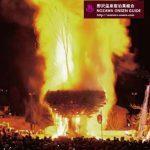 Looking for accommodation or hotels for the Nozawa Fire Festival? Click here! 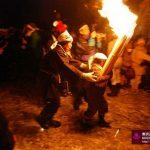 Fire and snow always go well and the Nozawa Onsen Fire Festival, Nozawa Onsen Dosojin Matsuri (or 野沢温泉の道祖神祭り in Japanese), exemplifies this as one of the three great fire festivals in Japan. The old roads that run like rivers between mountain towns in Japan are dotted with gods. 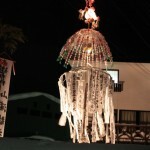 Known as dosojin, they are deities of roads and borders with their stone statues usually enshrined at village borders. Dosojin are good gods for the foreign traveller. 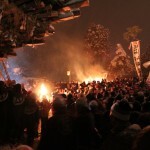 It takes roughly one hundred villagers to build the shrine for the Nozawa Fire Festival. 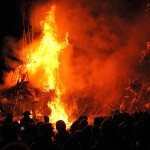 The trees are cut down in October and brought down from the mountain and through the village on January 13th prior to being made into a huge wooden structure or shaden. 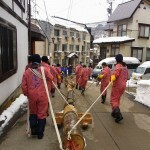 After the shaden has been constructed, the priest from Kosuge shrine performs a ceremony endowing it with a dosojin. 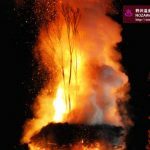 The highlight on January 15th is a “fire-setting battle” which ends up with the setting fire of the shaden with blazing torches by the offensive team and the offering of torches to the deity, making the festival truly spectacular and exciting. 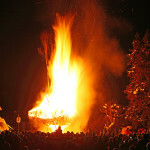 The entire festival is quite lengthy and can take up to four hours from the beginning to the end. Some observers gather just for the main attraction which is the battle between the guards and the torch bearing villagers. 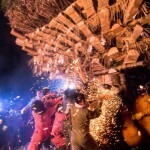 Add liberal servings of saké to all of the above and you’re sure to go home buzzing after seeing quite a spectacle – and maybe a bit scorched from the flames (don’t wear your new down jacket). 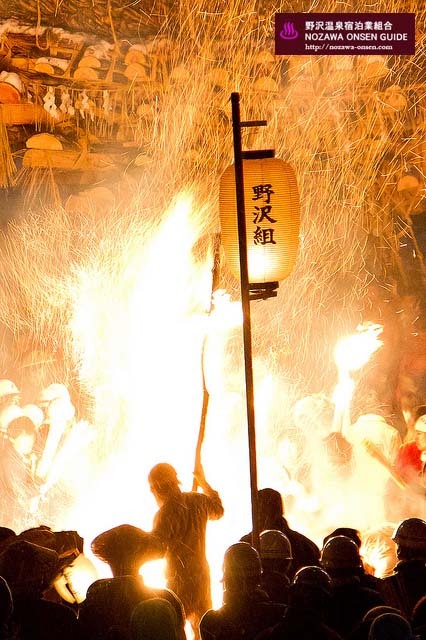 The famous Nozawa Onsen Fire Festival is nationally designated as an important intangible folk cultural property. 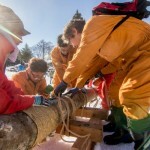 It originally began as an invocation for a good harvest, health and good fortune in the coming year, but has been expanded to include a good ski season as well. 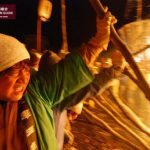 Taking place on January 15th every year, the festival is staged by men aged 42 and 25 (so-called “unlucky ages”) to celebrate the birth of a family’s first child, to dispel evil spirits and also to pray for happy marriage. 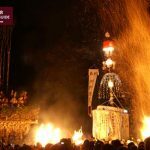 If you want to see more detailed background information on the Nozawa Fire Festival check this excellent local perspective. 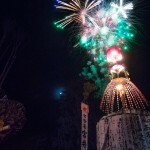 If you are coming to the Dosojin Matsuri book early! 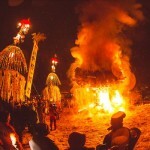 Accommodation for the Nozawa Fire Festival fills up fast. 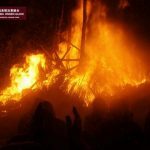 Can’t find fire festival accomm? 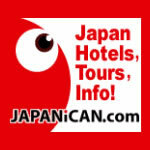 Stay in nearby Madarao and catch a shuttle. 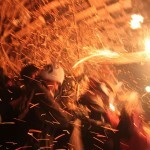 Enjoy yourself, the Nozawa Fire Festival is a fun and exciting, even crazy, occasion. You will rave about it to your friends once back home. 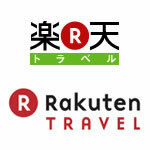 Enjoy the free sake that is offered and make friends. But do remember that you are not in your local pub back home, nor in a mosh pit at a concert. 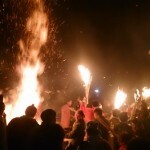 This a cultural festival with deep meaning for the local community and families. Use respectful language, do not push and shove and try not to block others views where possible. Also, despite all temptation, do not take ‘souvenirs’ of the evening. 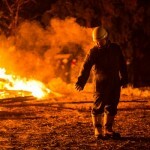 You may be lifting something that has deep meaning to a local family or the community. Just take home great memories and fantastic photos/videos! 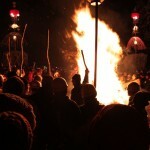 Dosojin fire festival Nozawa Onsen. 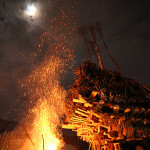 A steaming man at the Nozawa Onsen fire festival. 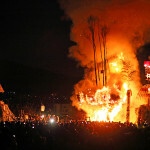 Nozawa Onsen fire festival 2013. 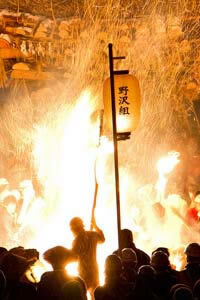 Nozawa Onsen fire festival 2013. The crowd admires the spectacle.